Demand for local food doesn't suddenly disappear at the first frost. Committed locavores want to buy local food year-round, providing new opportunities for fresh market growers who would like to increase annual revenue and cash flow during the winter. Community-Supported Agriculture is holding its own, despite economic ups and downturns. In fact, demand is so strong that more and more CSA farms have started to offer winter shares for members who want to eat local, year-round. Winter CSA is a much different endeavor than summer CSA, though, and it takes a lot of planning. But if you are thinking about ways to build on the success of your current CSA, expanding into winter is the logical next step. Winter CSA is possible in even the coldest parts of the globe. Some of the trailblazers in the winter CSA movement are located in New York, Massachusetts, Maine, Canada, Scandinavia, and other very cold places. They are able to offer their customers a combination of storage crops, winter hoophouse crops, hydroponically-grown crops, and value-added products. 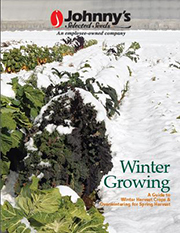 Because many of the winter crops and products offered have a long storage life, wintertime CSAs tend to distribute less often than summertime CSAs, some as infrequently as once a month. 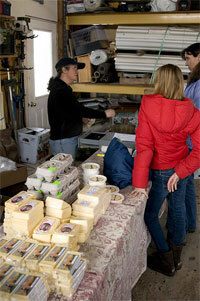 Another common feature of winter CSAs is intensive cooperation with other farms. Going into fall, most farmers know how many storage crops such as carrots, onions, and sweet potatoes they can offer to the CSA. But hoophouse crop growth and quality are more dependent on sunshine and temperature variations, and therefore less predictable. By teaming up with other growers and food producers, a CSA farm can fill gaps in its own production as well as increase the value of the CSA share and the availability of local products. A farm might offer eggs, bread, jam, honey, apples, frozen fruits and vegetables, and salsa made of ingredients grown on the farm or purchased from other farms. A winter CSA also provides a ready market for some crops that might not have been as useful to a summer CSA, such as dried beans, grains and flour, dried peppers and culinary herbs, soup mixes, and fall ornamentals. In that regard, wintertime community-supported agriculture provides the excitement of growing and offering something completely new! With all winter crops, planning well in advance is essential. If you're considering a winter CSA in the future, this winter is a good time to figure out what you'll want to include in every distribution. Come spring, you'll be ready to start planting new crops and larger quantities to accommodate a winter marketing season.